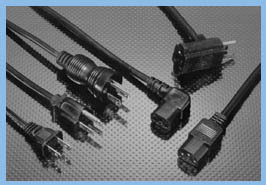 High Tech Connections has assembled one of the most comprehensive lines of in-stock and custom power cords and cord sets available. All cords are produced to strict manufacturing tolerances for mechanical quality, electrical integrity and final appearance. Cord products are tested at the factory to ensure design excellence and 100% safety. Standard products include hard-wired cords, detachable cords, rugged Hospital-Grade cords and electronic jumper cords. High Tech Connections has broad engineering and manufacturing capabilities allowing special customer designed cords to be produced exactly to specifications. Cord services include custom lead cutting and stripping; terminal and connector installation; molded strain reliefs, special colors and more. From prototype to short-run to high volume production manufacturing, High Tech Connections can efficiently accommodate our customer’s requirements for power cords and cord products.